In Canada, 222 is slang for over-the-counter Tylenol with codeine. I think I need some after reading this sign, spotted in Stevenson, WA, by Amanda. 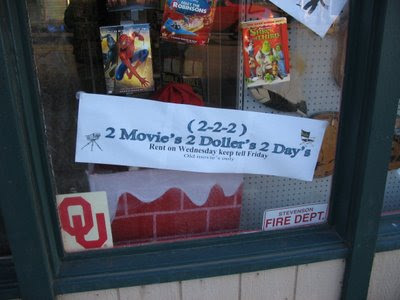 We've got apostrophe catastrophes, misspellings, and a missing comma (or semicolon) after "Wednesday." How many mistakes can they fit in one sign? 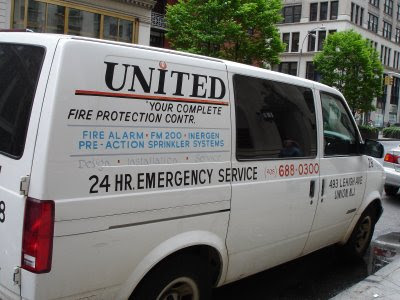 Looks like this van, seen in New York City, forgot to finish its slogan. Prince Charles Angry About Bad Grammar and Punctuation in the U.K. I have a new ally in the royal family. Read about it here. 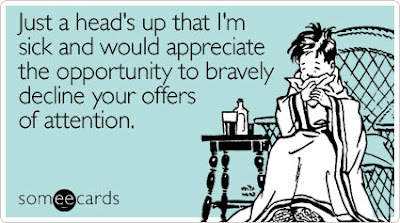 Oh, and it turns out that Carol was the one who sent me the Head's Up e-card. Thanks for sending me both of these apostrophe catastrophes, Carol! Also, I'd like to wish all of you out there in the blogosphere a very happy Thanksgiving. Cheers! He works for a Fortune 20 company, so you'd think there would be someone in his office who could write! 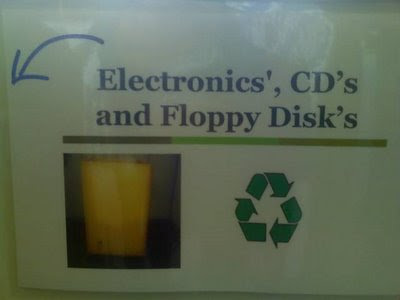 The mark after electronics doesn't even match the other apostrophes; it's a foot mark (or "dumb apostrophe"). 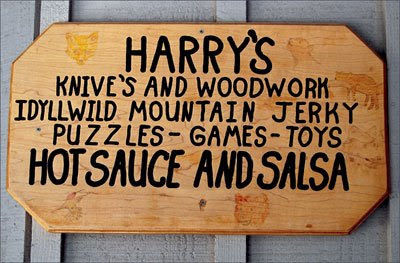 Besides the obvious mistake (knive's), I think it's funny that this sign has the word "jerky" thrown in there randomly. Before you carve something in wood, it's probably a good idea to plan a little better. James is such a dedicated punctuation vigilante that he created an online apostrophe quiz! Test your skills at The Writing Kit. Click on "Apostrophe Tutorial" on the left side of the page. Thanks, James! You are an apostrophe hero! If there's one thing you should have learned from reading Apostrophe Catastrophes it's that mens is not a word. 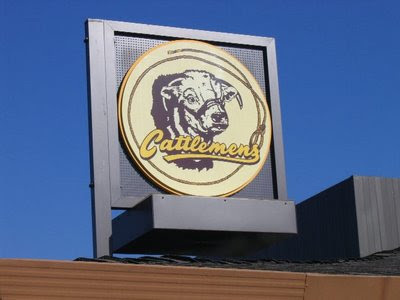 The owners of Cattlemens, a chain of steak houses in Northern California, clearly haven't been paying attention. Mary from Santa Rosa, who sent me this photo, says she thinks the restaurant wants to make it very clear that there's more than one cattleman. "I can't look at it without thinking of the 'Men on Football' sketch from In Living Color that was done for the Super Bowl," she writes. "You know, the one in which Blaine Edwards and Antoine Merriweather are talking about the 'big, sweaty mens with steam coming out they nostrils like bulls!'?" Stick around this blog and you'll see plenty of hot mens. Update: With so much talk about mens, Mary forgot to give credit to her boyfriend, Steve, for taking this photo. "I feel like Hilary Swank at the Oscars," she says. Thanks, Steve! Someecards is hilarious, but I found a card that contains a catastrophe! Or, actually, I don't think I found this one myself. I think my co-worker Amy spotted it, but I'm not sure. In any case, I think that this card would be appropriate for the occasion. Update: I take it back. Carol from the Apostrophe Catastrophes facebook group sent this one in. Thanks, Carol! Katie sent me two photos of catastrophes that she found on a Royal Caribbean cruise ship. Anyone for some rock climbing? 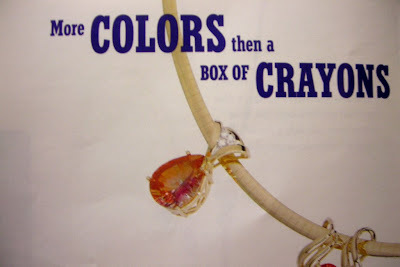 For the second catastrophe, the ship's in-room shopping catalog confuses "then" and "than." Being trapped on a ship filled with grammatical errors must have been terrifying. I'm glad that Katie survived and was able to share them with us. How noncommittal of them. Maybe it was written by one of those uptalkers who makes everything sound like a question. Thanks to Carrie for sending in our first question mark catastrophe! Professional Sign's & Lettering went out of business, but as far as we know, Mr. See is still driving around the Seattle area. 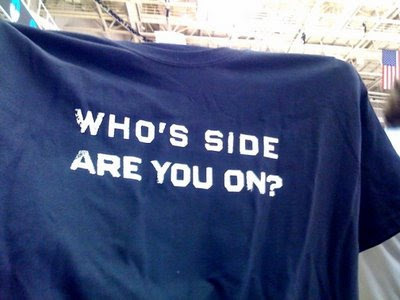 Who Is Side Are You On? Apparently, the San Jose Sharks had a preseason scrimmage called the teal and white game at which they gave out free t-shirts. I love free t-shirts, but this one was ruined by an apostrophe catastrophe on the back! As readers of this blog know, it should be Whose Side Are You On? Thanks to Craig for uploading this to AC's facebook group. 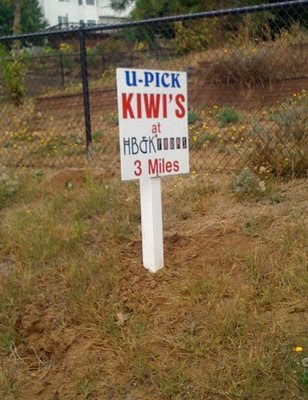 "I pick Kiwi's what?" Melissa asks. "Her nose? Eww." Domicile Furniture, which is a pretty funny name in and of itself, ran a full-page ad in the Chicago Tribune that featured "two wonderfully different types of errors," Winona writes. In the first photo, they add apostrophes to words that are already possessive. Oh, and if we want to be really picky, that hyphen should be an en-dash. They also don't seem to understand the phrase couldn't have. And, finally, cutting edge should have a hyphen. Thanks, Winona! It's a little blurry (I was drinking margaritas! 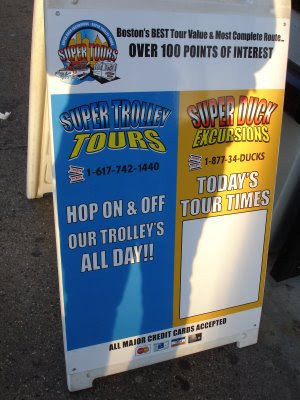 ), but you can definitely tell that there's an apostrophe catastrophe at the top of the sheet. 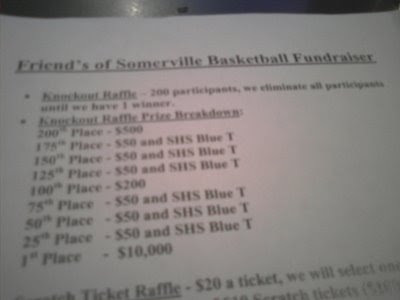 I think I'll donate money to the English department instead. Posting a screenshot of my own blog feels so postmodern. It also reminds me of how Stephen Colbert has a portrait of himself standing in front of a portrait of himself standing in front of a portrait of himself. I want one of those for my apartment, by the way. There's nothing like an errant (and backwards!) apostrophe to add even more class to a place where you can get your windows tinted. Stop making Boston look bad! 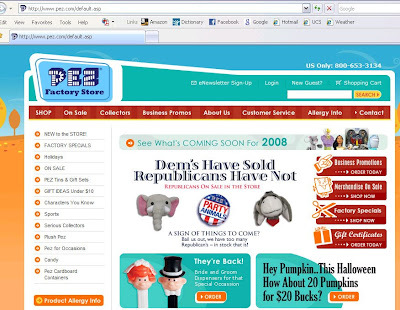 This blog's best contributor, my friend Merry, sent a screenshot of the Pez web site that's littered with errors. This pains her because she's a big fan of Pez dispensers. 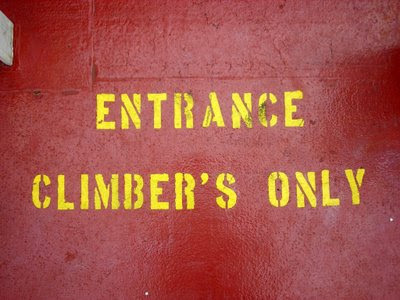 How many apostrophe catastrophes and other mistakes can you find? Why Do You <3 Bad Punctuation? This photo has been making the rounds on the Internet, but I thought it was worth posting anyway. I received it from a reader named Doc. For those of you who haven't seen the Why Do You <3 the Devil sign, be prepared. This may be the catastrophe to end all catastrophes. 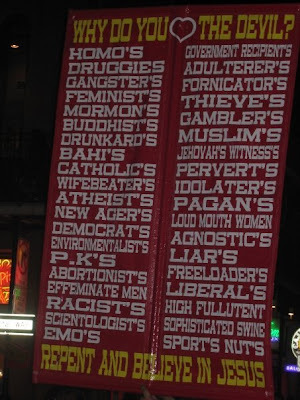 The sign-maker (I believe it's from New Orleans) is preaching fire and brimstone. He needs to repent and believe in punctuation. Of all the people he hates, the only one he didn't punctuate with an unnecessary apostrophe is druggies. Also, what is high fullutent? However, I do share his dislike for freeloader's and wifebeater's. She writes, "In Chicago, 'premier' apparently means 'the one that does not understand basic grammar.'" Thank goodness for DVR, and thanks to Carolyn for sending this! 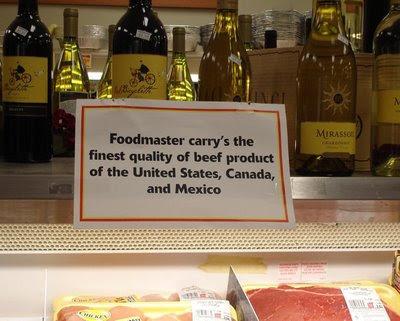 Besides the apostrophe catastrophe, I was disturbed by the phrase "beef product." Is it really beef? It makes me think of the fake butter that a lot of movie theaters use on their popcorn.